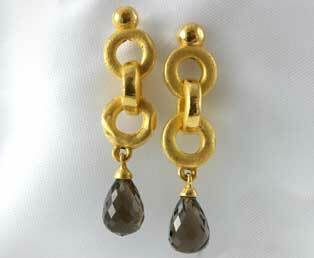 Beautifully cut brown topaz briolettes are featured in these vintage brown topaz briolette pendant earrings. These featured brown topaz gemstones are cut in a multi-faceted briolette cut. These two brown topaz stones are suspended from three rich golden loops. These golden loops are designed in an alternating vertical loop pattern. These rich loops have brushed gold faces, contrasted by other loops with smoothly polished sides. These vintage earrings have a high karat gold content of .9999, meaning they are almost pure gold. Pure gold has a fineness of .1000. Pure gold or gold jewelry made in almost pure gold is soft. Expect the gold posts to be soft and flexible, they will bend. However,they will be able to be bent back in place.